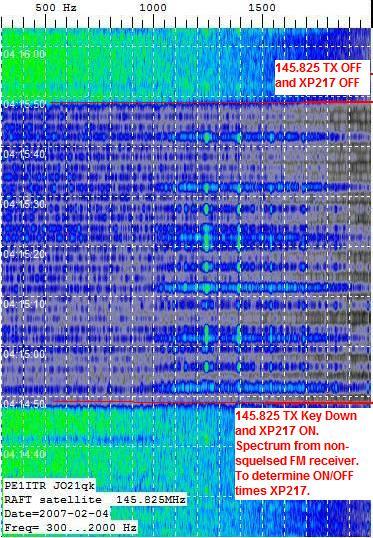 The XP217 transponder is a direct conversion receiver at 216.980MHz. 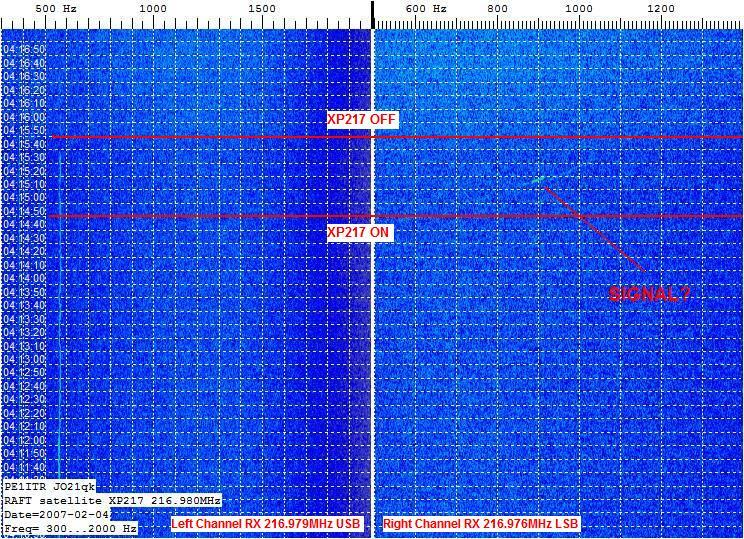 When the satellite is flying through the navspasur radar fence the audio is downlinked at 145.825MHz FM. The transponder is also a transmitter because of the 4 milliwatt oscillator leakage on 216.980MHz. The transponder can only be switched on by a command station. This webpage is about the detection of the 4 milliwatt oscillator by PE1ITR. The operators of the RAFT 217MHz transponder experiment above europe finaly meet at AMSAT-DL Bochum. 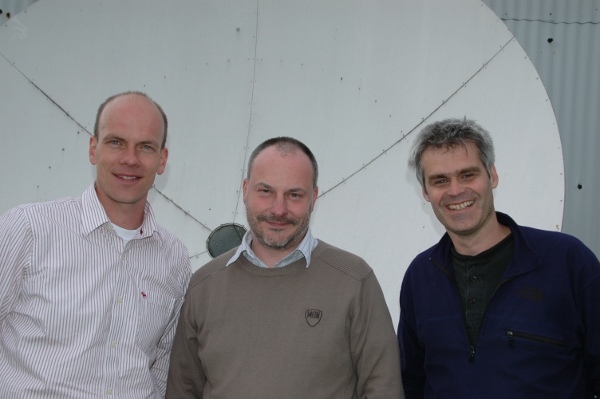 At the picture from left to right Henk PA3GUO, Mike DK3WN and Rob PE1ITR. Mike and Henk thanks for activating the oscillator and other RAFT/ANDE experiments at times 24hours a day. It was a great pleasure and fun too. RAFT Re-entry. More info on the RAFT Re-Entry Campaign page of Bob Bruninga, WB4APR. 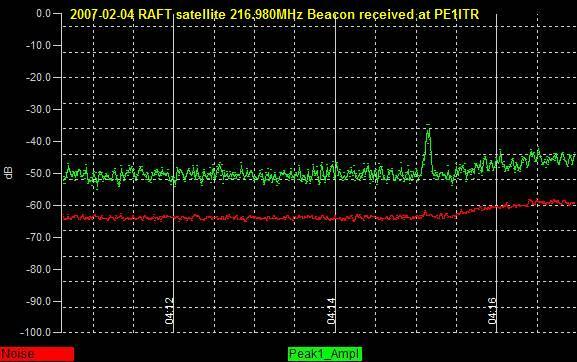 Image belowe 216.980MHz beacon switched on 2 times each for 1 minutes period. The doppler effect is visible in the image. We did again an experiment to receive the 4 milliwatt 216,980MHz beacon on RAFT. This one was very succesfull with great signals. 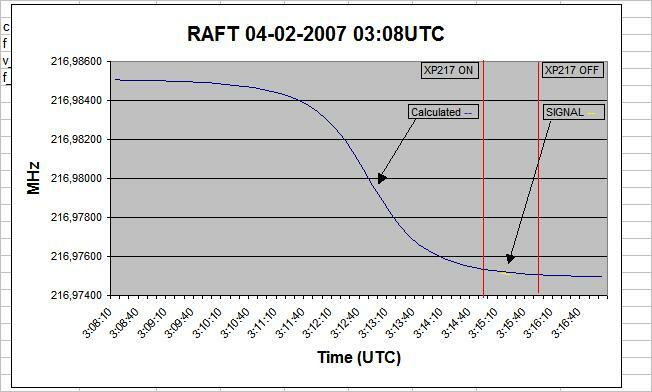 On april 6, 2007 around 22:19UTC command station DK3WN switched on the beacon 2 times each for an 1 minute period. For this occasion I changed my receiver setup. 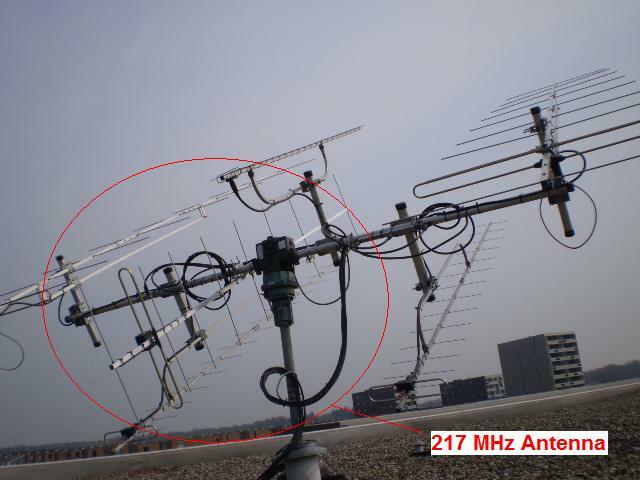 An 10 elements 217MHz yagi antenna was used. 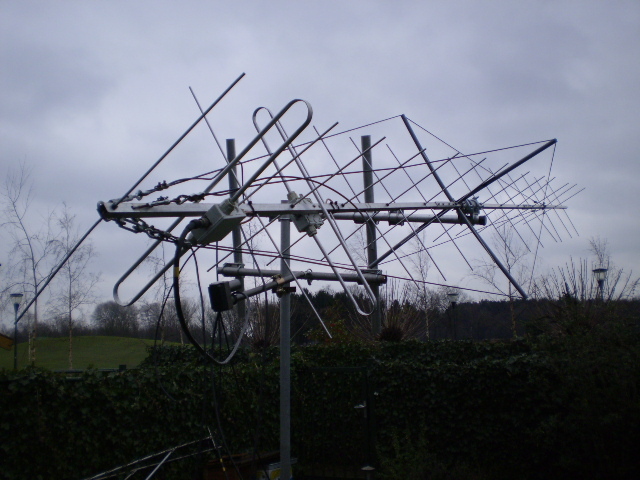 This yagi was mounted into the tower so I could track the satellite automatical. 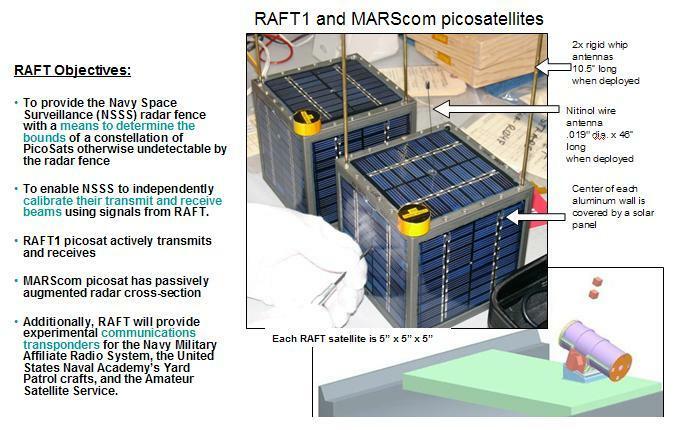 This was very necessary because RAFT is orbiting at 285km altitude nowadays. 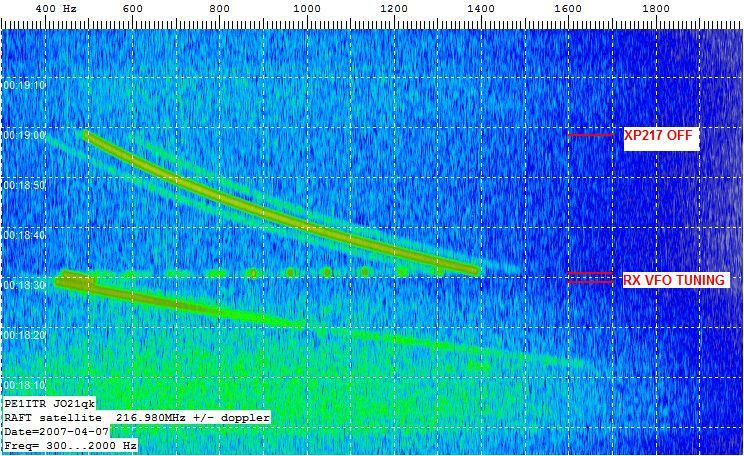 Recoding 1st 22:17UTC:WAV 1.5MB Signal with high doppler shift. 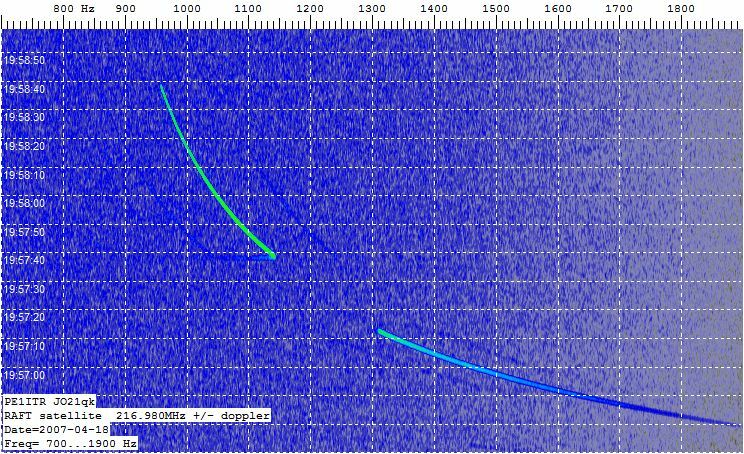 Recoding 2nd 22:19UTC:WAV 1.5MB Signal just before LOS, very stable, no satellite spin. Below the waterfall screenshots of the recordings. Note that times are local: 00:20Local = 22:20UTC. 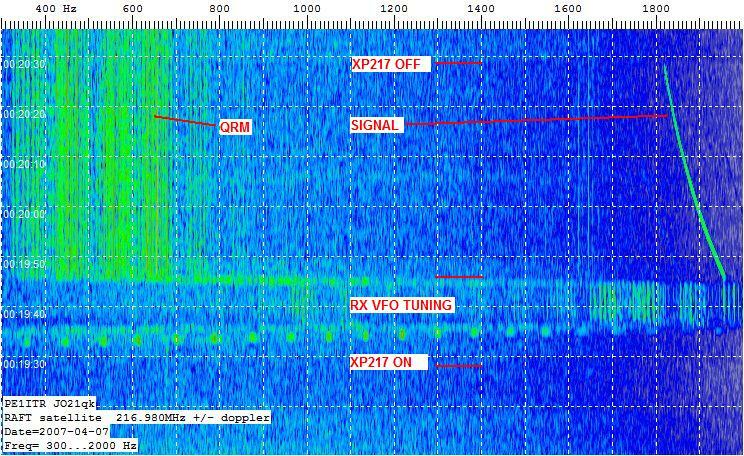 Recording from 216,980MHz XP217 beacon: WAV. Audio is filtered 200Hz. The signal is very weak but you can hear it just above the noise. There is a small dip in the signal because of the satellite spinning. Below the spectrum display where you can see the signal detected on the left channel window. The doppler sign is reversed because the receiver was in lower side band. Time in picture is local (=UTC+1). Receiver used is Yaesu FRG9600 + 3SK183 GaAs-fet mast mounted pre-amp ~1db NF + 2x14 elements 217MHz x-pol yagi with 15,4 dbi gain. The signal received was 30 db (in 1Hz) above the noise. Calculation of the expected freq versus time. Plot in Yellow the actual received signal. To determine the exact on/off time of the XP217 I used the on/off time of the 145.825MHz downlink. Both downlinks switch simultaneously.